PA chairman blasts Nationality Law as "racist", says the Palestinians will continue the struggle to realize the "sacred" right of return. 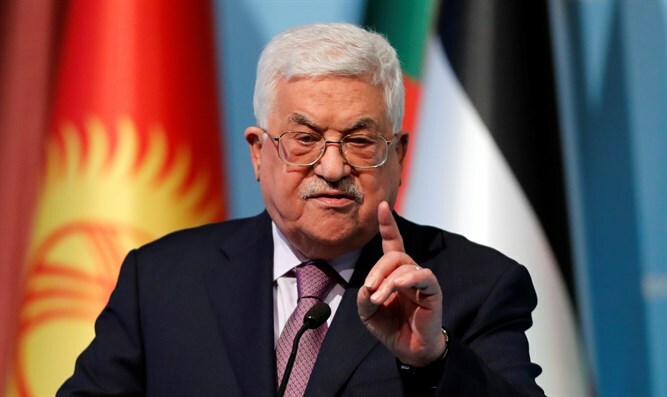 A statement issued on behalf of Abbas said that there would be no peace, security or stability for anyone without Al-Quds and that no one has the authority to give it up. Abbas also condemned the Nationality Law which was approved by the Knesset on Wednesday night and specifically the reference in the legislation to united Jerusalem as the capital of Israel. This law exposed "the racist face of the Israeli occupation and the violations of all international legitimacy decisions by it," he claimed. Abbas’ office called these laws "nullified" and "racist" and stressed that they would not change the historical status of the city of Al-Quds as the capital of “the occupied Palestinian state” and would not dissuade the Palestinian people from continuing its legitimate struggle to remove the occupation and establish its independent state. In addition, Abbas’ office stressed the right of the Palestinian people to return to their land, noting that the “right of return” is a sacred and permanent right granted by international law, including UN Resolution 194, which stipulates the right of return of Palestinian “refugees” to their land and property. The “racist Nationality Law,” said the statement, will not abolish this holy right.